After China earlier this year, the next planned trip was the one to Florida and the Caribbean. So the bonus trip to Vietnam was unexpected, admittedly there was a work component at the end but why not use the opportunity to explore another country we hadn’t thought of doing any time soon. With only 6 days available towards the north of the country, we had to decide what it was we wanted to do before we got there. We booked a Charitable Tour of Hue and Hoi An with AdventureWorld. Flying with Vietnam Airlines – the food was good, seats were comfortable with good leg room in economy and the best surprise was being able to order 2-minute cup noodles throughout the flight. Score!! And we were simply looking forward to eating loads and loads of pho. about 50%” as opposed to the usual 80-90% they had been experiencing not that long ago. Geez, we were feeling it at 50%. The heat wasn’t the only thing we needed to get use to. 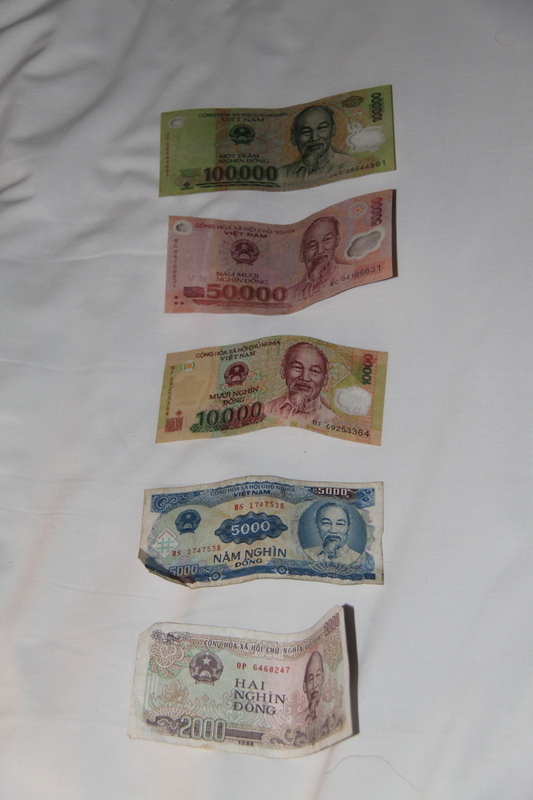 It was also the currency; the Vietnamese dong – spending in hundreds of thousands and millions. So we can technically say we were millionaires for a week. The exciting thing for us though was that the money was plastic like the Australian notes. After one night in Hanoi, we flew to Hue and stayed in an amazing hotel, Hotel Saigon Morin. Air-con in the room was blissfully cool. We enjoyed wandering the streets but not so much the crossing of the roads. Seriously, the amount of motorbikes and scooters on the streets are intense. We were clearly instructed that to cross the roads, you do it slowly. Do not run! How can you not run when you have hundreds of vehicles flooding towards you? Your instinct automatically tells you to run for safety from one footpath to the other footpath which is 4 lanes across. But the secret is finding a little break in the flow and stepping down and proceeding slowly while looking at the oncoming traffic – it was the in-between of not hesitating and not making that mad dash. This was going to take some getting use to. To avoid crossing the road, we kept making right turns as that was the only option other than to turn back. Before long, we decided that we needed to cross the road to find something to eat. We watched how the Vietnamese people do it and they made it looks so easy. It clearly is a skill! With our hearts pounding and sweaty palms, we clung onto each other’s hands to refrain ourselves from bolting across. Miraculously, we made it to safety only to come to the realisation that we would have to do the same thing just to get back to the hotel after lunch. Oh well, we will deal with that later. For the time being we would enjoy what we could without having to cross too many more busy roads. This entry was posted in Asia, Vietnam and tagged Hanoi, Vietnam.